James Mallows believes Whitworth’s debut season in the ChromaSport United Counties League Premier Division has been a “learning curve”. The Flourmen have been in the lower half of the table for most of the campaign but are clear of the relegation places with 13 games to play. And that gap could become even more comfortable if they can claim a win over Sleaford Town, one of the teams below them, at London Road this weekend. Mallows believes his team are capable of finishing the season with a flourish but it has been a testing campaign for one of the few clubs in the top flight who work without a playing budget. “This season has been a big learning curve for everyone at the club and as long as we learn the lessons then that will be a good thing,” Mallows said. “We haven’t been playing that badly and that’s probably the most frustrating thing. “We have produced some honest and battling performances but just haven’t really been able to put it all together. “One week we are not good enough defensively and the next we aren’t good enough attacking wise. “I think a lot of that comes down to the personnel that has been missing due to injuries, suspensions and other things. “We are one of the few clubs in the Premier Division that doesn’t have a budget and I think that, sadly, plays a part as well when it comes to commitment. “But I still believe we are capable of having a decent run until the end of the season. However, on the flip side, we could easily just struggle through as well. “But I certainly don’t have any concerns about being right down there at the very bottom. Stern tests lie ahead for both Wellingborough Town and Rothwell Corinthians this weekend. The Doughboys, who made it two wins in a row by beating Eynesbury Rovers last Saturday, head to title-chasing Holbeach United. And Corinthians are also on the road as they make the trip to Wisbech Town who are also in the hunt at the top end of the table. There will be a bit of familiarity to the next few days for Desborough Town. Ar Tarn head to Leicester Nirvana in the Premier Division tomorrow (Saturday) before the two teams meet again at the Waterworks Field next Tuesday night for the UCL Knockout Cup semi-final. Raunds Town will bid to bounce back and maintain their push for the second promotion spot in Division One when they host Bourne Town this weekend. 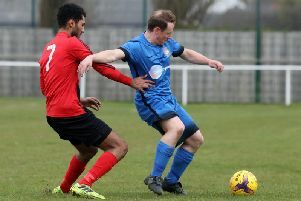 The Shopmates were edged out 1-0 at champions-elect Pinchbeck United last Saturday but still hold a seven-point advantage over third-placed Potton United. Rushden & Higham United’s hopes of securing the runners-up spot suffered a blow as they were beaten 2-1 by Harrowby United last time out. The Lankies face another tough test this weekend as they play Lutterworth Town at Hayden Road with the visitors just one point and one place below them in the table. Bottom meets top at Occupation Road as Stewarts & Lloyds have the unenviable task of taking on leaders Pinchbeck and Thrapston Town, 2-1 winners at Burton Park Wanderers in their last outing, also have home advantage as they entertain Buckingham Town at Chancery Lane. Meanwhile, there is a local derby on the cards at Alfred Street as Irchester United take on Wanderers in a meeting of the two beaten NFA Junior Cup semi-finalists.